Twenty- and 50-round boxes of Littlestone Ammunition's loading of the .357 Magnum cartridge with 125-grain Barnes TAC-XP Solid Copper Hollow Point bullets. Hover cursor or click on photo for close-up view. Firearm not included. I understand that federal law requires I be at least 21 years old to purchase handgun ammunition and by checking this option I attest that I am at least 21 years old. 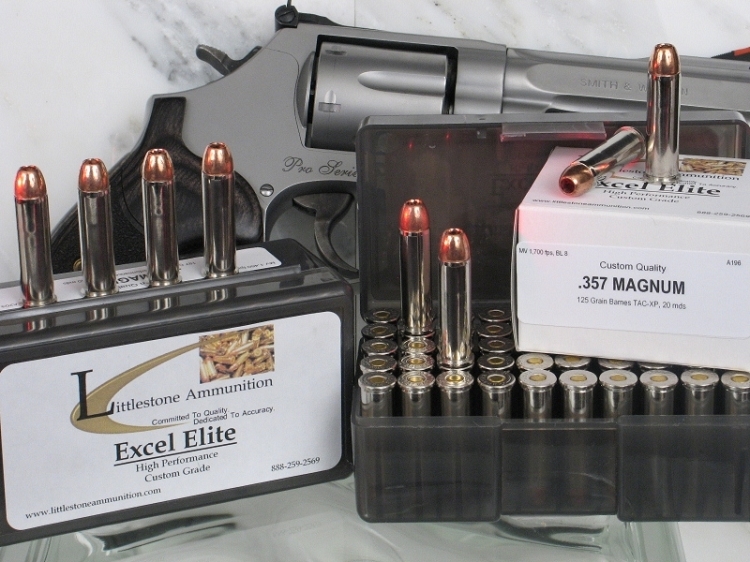 Get 50 rounds of fight stopping, game dropping, barrier penetrating power for your .357 Magnum revolver with this superb custom grade handgun Excel Elite ammunition from Littlestone Ammunition. This custom revolver ammunition launches a 125-grain Barnes TAC-XP bullet at 1,700 fps. Accuracy. Power. Super Penetration. Deadly Effect On Target. These are just a few of the outstanding qualities for which Barnes solid copper bullets are renowned. In this loading, they culminate in one of the worlds greatest defensive loads that also doubles as an excellent hunting round for small to light/medium game, including smaller deer. These solid copper hollow point bullets have earned a reputation of virtually 100% weight retention, expansion to about double original width, and extremely deep penetration. Barnes bullets also are well known for their ability to delivery exceptional hydrostatic shock from a wide wound channel and usually a complete pass through for abundant bleeding. If you want an exceptional hunting and self defense loading for your .357 Magnum revolver, this should be at the top of your list. Factory ammunition of loadings featuring this bullet sell elsewhere for $35 MORE than Littlestone Ammunition's custom grade .357 Magnum revolver ammunition. Finding that load can be expensive if you have to buy a full box of 20 or 50 rounds for every type you want to try. Which is why we developed our sample pack system. With one purchase of 20 or 50 rounds, you can test either four or five different loads, helping you find ammo that meets all your needs much more economically. Each of our sample packs comes complete with the written load number record of each load in the pack, and a color-coded test-fire evaluation form. So you might consider testing one or more of our sample packs containing this bullet, which can be found in a variety of the Sample Pack product listings for this cartridge. After you test one or more sample packs, if you and your gun like the load, come back and purchase it in greater quantities. Of course, if you prefer, use the Add To Cart button above to purchase this 50 rounds of Littlestone Ammunition now. * Please see REDUCED COST RELOADING SERVICE page for Reloading Service Program and Pricing details. Feature 3: MV / Energy / Barrel: 1,700 fps / 802 ft lbs / 8"
Copyright 2018 Littlestones. All Rights Reserved.